The domain within your query sequence starts at position 319 and ends at position 492; the E-value for the SEC14 domain shown below is 5.13e-53. Domain in homologues of a S. cerevisiae phosphatidylinositol transfer protein (Sec14p) and in RhoGAPs, RhoGEFs and the RasGAP, neurofibromin (NF1). 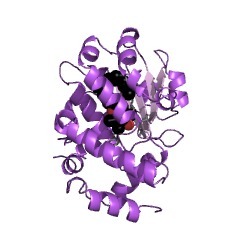 Lipid-binding domain. 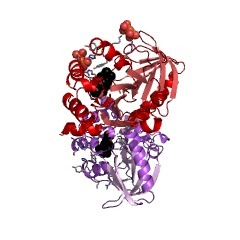 The SEC14 domain of Dbl is known to associate with G protein beta/gamma subunits. The CRAL-TRIO domain is a protein structural domain that binds small lipophilic molecules [(PUBMED:12767229)]. The domain is named after cellular retinaldehyde-binding protein (CRALBP) and TRIO guanine exchange factor. 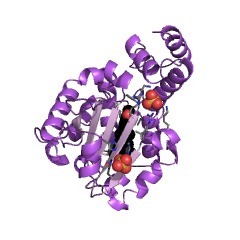 The CRAL-TRIO domain is found in GTPase-activating proteins (GAPs), guanine nucleotide exchange factors (GEFs) and a family of hydrophobic ligand binding proteins, including the yeast SEC14 protein and mammalian retinaldehyde- and alpha-tocopherol-binding proteins. The domain may either constitute all of the protein or only part of it [(PUBMED:2198263), (PUBMED:8349655), (PUBMED:9461221), (PUBMED:10829015)]. 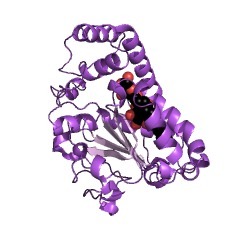 The structure of the domain in SEC14 proteins has been determined [(PUBMED:9461221)]. 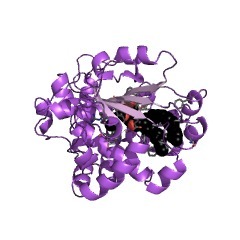 The structure contains several alpha helices as well as a beta sheet composed of 6 strands. Strands 2,3,4 and 5 form a parallel beta sheet with strands 1 and 6 being anti-parallel. 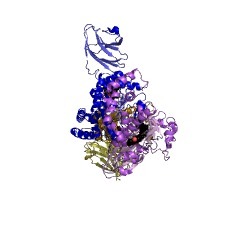 The structure also identified a hydrophobic binding pocket for lipid binding. 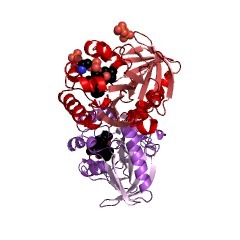 There are 22196 SEC14 domains in 22009 proteins in SMART's nrdb database. Taxonomic distribution of proteins containing SEC14 domain. This tree includes only several representative species. The complete taxonomic breakdown of all proteins with SEC14 domain is also avaliable. Click on the protein counts, or double click on taxonomic names to display all proteins containing SEC14 domain in the selected taxonomic class. 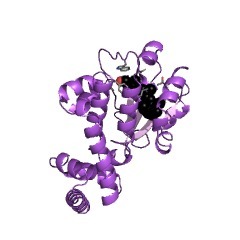 Sec14p-like domains in NF1 and Dbl-like proteins indicate lipid regulation of Ras and Rho signaling. 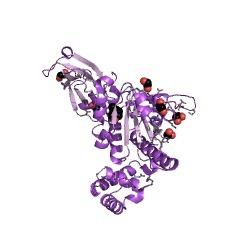 Crystal structure of the Saccharomyces cerevisiae phosphatidylinositol-transfer protein. The yeast phosphatidylinositol-transfer protein (Sec14) catalyses exchange of phosphatidylinositol and phosphatidylcholine between membrane bilayers in vitro. In vivo, Sec14 activity is essential for vesicle budding from the Golgi complex. 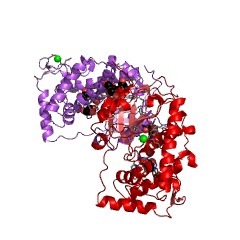 Here we report a three-dimensional structure for Sec14 at 2.5 A resolution. 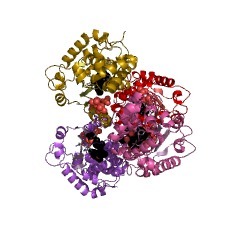 Sec14 consists of twelve alpha-helices, six beta-strands, eight 3(10)-helices and has two distinct domains. 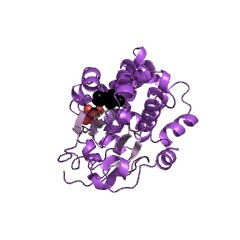 The carboxy-terminal domain forms a hydrophobic pocket which, in the crystal structure, is occupied by two molecules of n-octyl-beta-D-glucopyranoside and represents the phospholipid-binding domain. 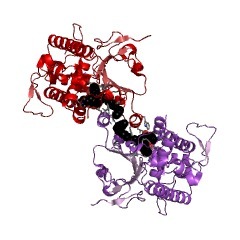 This pocket is reinforced by a string motif whose disruption in a sec14 temperature-sensitive mutant results in destabilization of the phospholipid-binding domain. 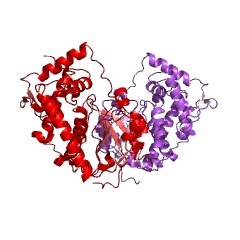 Finally, we have identified an unusual surface helix that may play a critical role in driving Sec14-mediated phospholipid exchange. 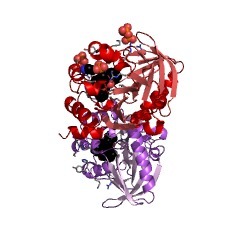 From this structure, we derive the first molecular clues into how a phosphatidylinositol-transfer protein functions. UNC-73 activates the Rac GTPase and is required for cell and growth cone migrations in C. elegans. unc-73 is required for cell migrations and axon guidance in C. elegans and encodes overlapping isoforms of 283 and 189 kDa that are closely related to the vertebrate Trio and Kalirin proteins, respectively. 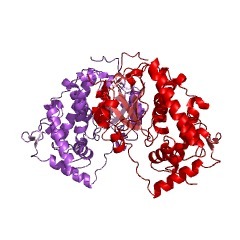 UNC-73A contains, in order, eight spectrin-like repeats, a Dbl/Pleckstrin homology (DH/PH) element, an SH3-like domain, a second DH/PH element, an immunoglobulin domain, and a fibronectin type III domain. UNC-73B terminates just downstream of the SH3-like domain. The first DH/PH element specifically activates the Rac GTPase in vitro and stimulates actin polymerization when expressed in Rat2 cells. Both functions are eliminated by introducing the S1216F mutation of unc-73(rh40) into this DH domain. Our results suggest that UNC-73 acts cell autonomously in a protein complex to regulate actin dynamics during cell and growth cone migrations. Characterization of two structurally related Xenopus laevis protein tyrosine phosphatases with homology to lipid-binding proteins. We have chosen Xenopus laevis as a model system to study how protein tyrosine phosphatases (PTPases) function in growth and development. As an initial step, we have previously isolated in a polymerase chain reaction (PCR)-based protocol cDNA fragments which correspond to sequences within the catalytic domains of PTPases (Yang, Q., and Tonks, N. K. (1993) Adv. 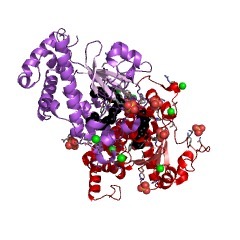 Protein Phosphatases 7, 359-372). Two of these PCR products, designated X1 and X10, have now been used to screen a X. laevis ovary cDNA library to obtain complete coding sequences for two distinct PTPases. 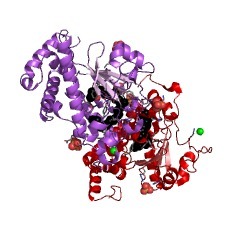 The X1 cDNA encodes a protein (PTPX1) of 693 amino acids (approximately 79 kDa); the X10 cDNA encodes a protein of 597 amino acids (approximately 69 kDa). Both PTPX1 and PTPX10 lack potential membrane spanning sequences and therefore can be classified as non-transmembrane/cytoplasmic PTPases. 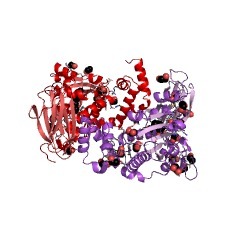 While the overall structure of these PTPases are similar, sharing segments of 95% amino acid identity, they differ in that PTPX1 contains a unique 97-amino acid insert between the N-terminal segment and C-terminal catalytic domain. The absence of complete identity between PTPX1 and PTPX10 suggests that these two sequences are the products of separate genes and not the result of alternative splicing. This conclusion is confirmed by PCR analysis of Xenopus genomic DNA. 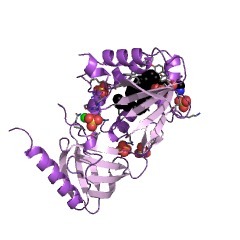 Both PTPases share sequence identities in their N-terminal segments with two lipid-binding proteins, cellular retinaldehyde-binding protein and SEC14p, a phospholipid transferase. 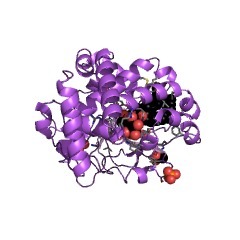 In addition, the unique insert sequence of PTPX1 shares identity with PSSA, a protein involved in phosphatidylserine biosynthesis. Sequence comparison suggests that PTPX10 is the Xenopus homolog of the human PTPase Meg-02, while PTPX1 is a structurally related yet distinct PTPase. Intrinsic PTPase activity of PTPX1 and PTPX10 was demonstrated in lysates of Sf9 cells infected with recombinant baculoviruses encoding either enzyme. PTPX1 can be recovered in both soluble and membrane fractions from Xenopus oocytes with the membrane form exhibiting approximately 4-fold higher activity than the soluble form. Cloning and expression of a cytosolic megakaryocyte protein-tyrosine-phosphatase with sequence homology to retinaldehyde-binding protein and yeast SEC14p. Protein tyrosine phosphorylation is important in the regulation of cell growth, the cell cycle, and malignant transformation. We have cloned a cDNA that encodes a cytosolic protein-tyrosine-phosphatase (PTPase), MEG2, from MEG-01 cell and human umbilical vein endothelial cell cDNA libraries. The 4-kilobase cDNA sequence of PTPase MEG2 corresponds in length to the mRNA transcript detected by Northern blotting. 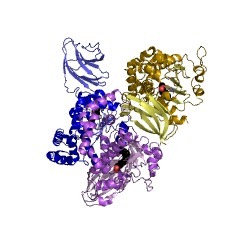 The predicted open reading frame encodes a 68-kDa protein composed of 593 amino acids and has no apparent signal or transmembrane sequences, suggesting that it is a cytosolic protein. 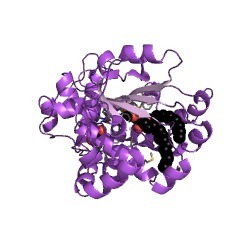 The C-terminal region has a PTPase catalytic domain that has 30-40% amino acid identity to other known PTPases. 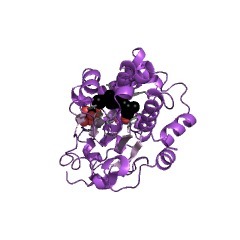 The N-terminal region has 254 amino acids that are 28% identical to cellular retinaldehyde-binding protein and 24% identical to yeast SEC14p, a protein that has phosphatidylinositol transfer activity and is required for protein secretion through the Golgi complex in yeast. Recombinant PTPase MEG2 expressed in Escherichia coli possesses PTPase activity. 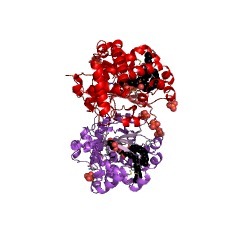 PTPase MEG2 mRNA was detected in 12 cell lines tested, which suggests that this phosphatase is widely expressed. 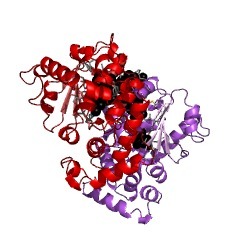 The structure of PTPase MEG2 implies that a tyrosine phosphatase could participate in the transfer of hydrophobic ligands or in functions of the Golgi apparatus. An essential role for a phospholipid transfer protein in yeast Golgi function. Progression of proteins through the secretory pathway of eukaryotic cells involves a continuous rearrangement of macromolecular structures made up of proteins and phospholipids. 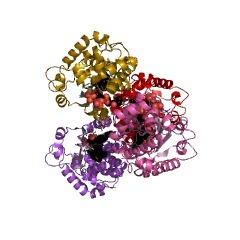 The protein SEC14p is essential for transport of proteins from the yeast Golgi complex. Independent characterization of the SEC14 gene and the PIT1 gene, which encodes a phosphatidylinositol/phosphatidylcholine transfer protein in yeast, indicated that these two genes are identical. 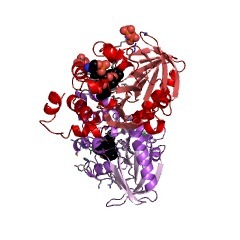 Phospholipid transfer proteins are a class of cytosolic proteins that are ubiquitous among eukaryotic cells and are distinguished by their ability to catalyse the exchange of phospholipids between membranes in vitro. We show here that the SEC14 and PIT1 genes are indeed identical and that the growth phenotype of a sec14-1ts mutant extends to the inability of its transfer protein to effect phospholipid transfer in vitro. These results therefore establish for the first time an in vivo function for a phospholipid transfer protein, namely a role in the compartment-specific stimulation of protein secretion. SwissProt sequences and OMIM curated human diseases associated with missense mutations within the SEC14 domain. This information is based on mapping of SMART genomic protein database to KEGG orthologous groups. Percentage points are related to the number of proteins with SEC14 domain which could be assigned to a KEGG orthologous group, and not all proteins containing SEC14 domain. Please note that proteins can be included in multiple pathways, ie. the numbers above will not always add up to 100%.